For the last six months at work I’ve been on desserts, getting to grips with the complexities of sugar, caramel, chocolate and eggs in all their different forms (not to mention all the fantastic fruit and berries in season just now!). Chocolate is a steadfast ingredient in any dessert menu and quite fascinating to work with. Recently I have just learned how to temper chocolate to give it an amazingly shiny, brittle finish. It’s not the easiest thing to achieve; a precise technique that’s really satisfying when it works properly! Another thing I’ve been getting my head around is chocolate mousse; a classic dessert which is subtly difficult to perfect. 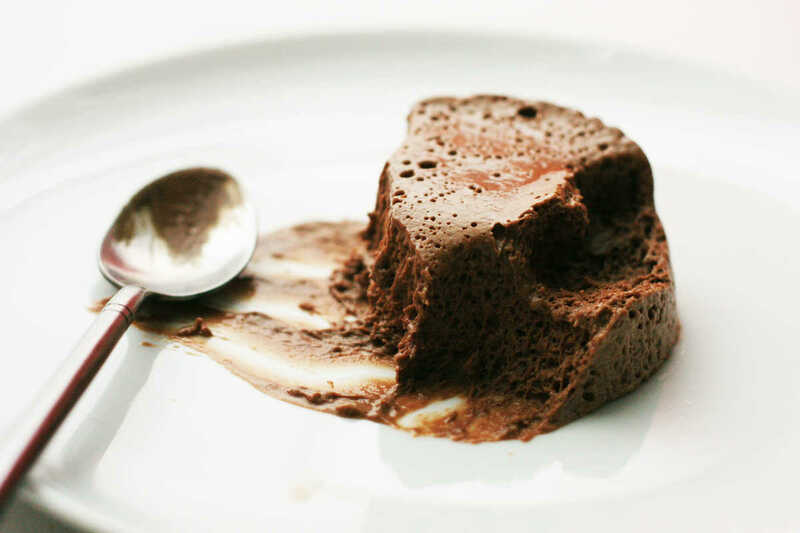 I remember making it when I was young; whipped cream folded into melted chocolate, always resulting in a smooth but rather dense and rich mousse. A perfect mousse should be really light and have a true melt-in-the-mouth texture; not what I have in my memories of childhood! The lightness comes from incorporating whipped cream and whipped egg whites into the melted chocolate, but the result depends of the temperature of the chocolate; too hot and the air will collapse from the mousse; too cold and the chocolate will sieze up and become grainy. This recipe works well, the secret here is to heat and whisk egg yolks with sugar and water (or coffee, as in this recipe) to create a silky light sabayon which the chocolate is then melted into. From there I add whipped cream, and lastly some soft whipped egg whites to make it extra light and aerated. Place the egg yolks, 50g of sugar and coffee in a bowl and whisk over a pan of simmering water until thick and silky to create a sabayon. Mix in the chocolate and stir until melted. Take off the heat and set aside. Quickly whip the cream until it forms soft peaks. In a separate bowl, whisk the egg whites until they also form soft peaks, then gradually add the remaining 25g of caster sugar whilst continuing to whisk vigorously, until fully incorporated. Set aside. Pour the chocolate sabayon into another bowl to cool it slightly (it should be around 35-40 C), then fold the cream in stages, mixing the first spoonful vigorously to stabilise the mixture so it doesn’t sieze. Once the cream is mixed in, gently fold the egg white mixture in. Pour the mousse into moulds or dishes and leave in the fridge for a minimum of 6 hours to set.